I’ve been seeing a lot of coverage lately about the new Rapunzel restrooms/rest area in the Magic Kingdom, recently opened as part of the Fantasyland expansion. I don’t think that I’ve ever seen so much excitement over toilets. Now, these are DISNEY toilets, so of course they are fairly extraordinary – right? I’ll give you my verdict after my early May park visit. In the interim, it got me thinking about my favorite Disney bathroom break spots and I wanted to share some with you. Folks, my hubby insists that I pack our own toilet paper (TP) from home for use in our resort guest room, even when we stay at a deluxe resort. Apparently his tush is too sensitive for the environmentally-friendly paper that Disney has taken to stocking in their hotel properties. I never had an issue with the tissue, but some folks might want to plan accordingly. Personally, I don’t care if the place I go to do my business is fancy – I just want it to be clean. This is a difficult thing to do, especially on weekends when parks are crowded. Following are a few of my favorite restrooms in each park as well as hidden gems to check out on your next trip. · The restrooms behind Casey’s Corner closest to the First Aid station are often deserted and very clean. · The restrooms located between City Hall and the Fire Station, as they are at the very front of the park, are the most crowded and dirty. Walk a little further down Main Street USA to check out the hidden gem instead. · The restrooms located inside the passage that connects Frontierland and Adventureland (close to the Country Bears) provide some much needed shade for waiting party members and generally are not too crowded unless there’s a tour group coming through. · Although a bit out of the way, the restrooms located between the park EXIT (via Future World) and the bus depot are often deserted. A bit out of the way as you’re entering the park, but a great pit stop if a bus ride back to your resort is on tap. · In World Showcase, the restrooms located in the China pavilion service both the table service and counter service restaurant and are always crowded and dirty. · In Future World, there are restrooms located in the Imagination pavilion to the FAR right past the entrance to Figment. Never crowded and always clean! · The restrooms located near the exit of Finding Nemo: The Musical are often deserted during show times, but avoid them when the show lets out. · The restrooms in Rainforest Café are often clean, but are reserved for those eating at the restaurant, which I don’t recommend. · The restrooms in Harambe Village are often busy, but are well maintained and an ideal pit stop prior to riding Kilimanjaro Safaris or when exiting the parks after a long day. · The restrooms located in the Animation Courtyard are a little off the beaten path and never crowded. · The restrooms located near the Indiana Jones Stunt Spectacular exit and to the left of Sounds Dangerous are often neglected from a cleanliness standpoint and can be crowded when these attractions let out at different times during the day. 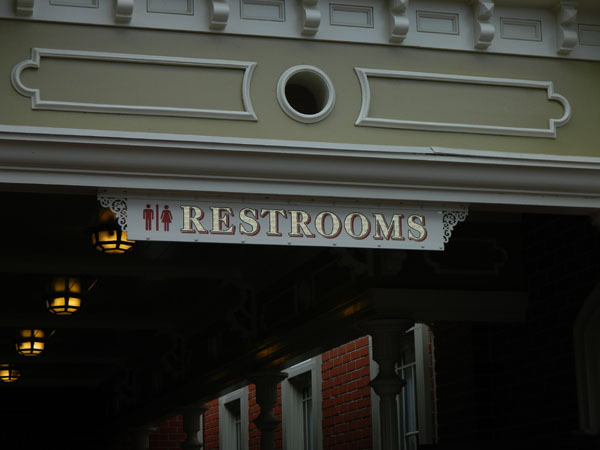 · Despite being located adjacent to the park’s most popular attraction – Toy Story Midway Mania – the restrooms in Pixar Place almost never have a line and are well stocked. Be sure to make a pit stop before waiting in that 90 minute line for TSMM. So there you have it, readers. 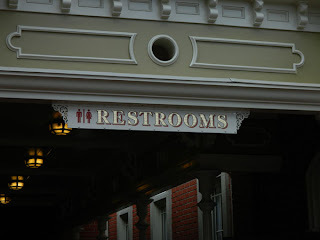 My two cents on some of the best restrooms that Walt Disney World has to offer. As mentioned above, I’ll be sure to rate and review the Rapunzel rest area during my upcoming trip and since I’ll be 17 weeks pregnant when we hit the parks, I’m sure that I’ll have even more tips and advice to share. Another not so good bathroom is the one at Animal Kingdom nearest to Kali River Rapids, the floor is always wet from dripping people getting off the ride. People trying to dry their clothes using the Xcelerator hand dryer . . . I love the bathroom at Animal Kingdom behind the asian quick serve food place. A good topic! With two small children (one that was still potty training and one in diapers) this was something I had looked into before going earlier this year. Cleanliness is def important, especially when you have little hands touching things. I will have to put this post on pinterest for the next time we go there. My wife actually knows where all the bathrooms are in each park (she has visited Disney A LOT), and we surprised at EPCOT with a new bathroom -- near the roses (veer right as you get into the countries). The entrance to them is really tight, there aren't enough stalls, and they are tucked in and confusing (we saw several people walk up, see the women's room, and not be able to find the men's room). On the plus side, there is a companion restroom. But, if I had to categorize it, I'd mark it as "avoid." PS: I agree with all of your avoid/recommend above!